loved, especially when they are away from home. Are you also concerned about your pet’s security? Well, it’s the right time to say good-bye to your worries. Simply purchase a durable kennel and provide a protected shelter to your dog, simple as that! No doubt, different kinds of crates are available in the market nowadays, and it is not an easy task to choose the best one among them. If you are also facing a similar situation, then this review will be quite helpful for you. Precision is a leading brand that has been manufacturing pet cages for past many years. 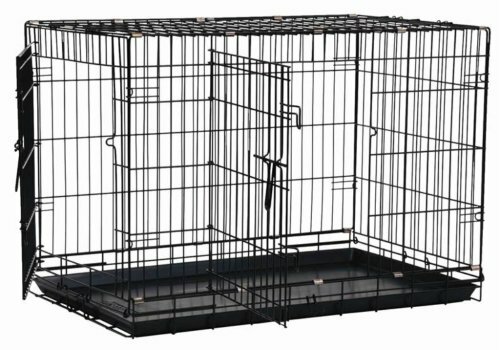 Precision Pet Two-Door Great Crate is one of their populous products that promises to offer a safe and comfortable zone to your canine. All in all, this two-door kennel is equipped with all the necessary features that must be present in a pet cage. Not convinced yet? Don’t conclude anything until you read about this phenomenal cage till the end. It is suggested to always go through the features of “the product” before taking any buying decision. So, find the details about this crate below. Majority of the pooch crates possesses single door that provides limited access within this cage. Unlike other kennels, Precision crate comes with 2 doors so that the pet owners can have better access. One entrance is located at the front side, whereas the other door is present on the long side of cage. In this way, your canine can easily exit or enter into this cage through either of these doors. Moreover, you will also have 2 options for putting in the food for your beloved, as per your convenience. Are you unable to supervise your puppy throughout the day? Do you feel insecure while leaving your dog all alone at home? Well! This crate will resolve all your issues because it offers 100% safety to your beloved in your absence. All sides of this cage are risk-free and protected. A secure lock system is there so that your pooch can remain safe inside, no matter for how long. Now there is no need to supervise your canine 24/7. 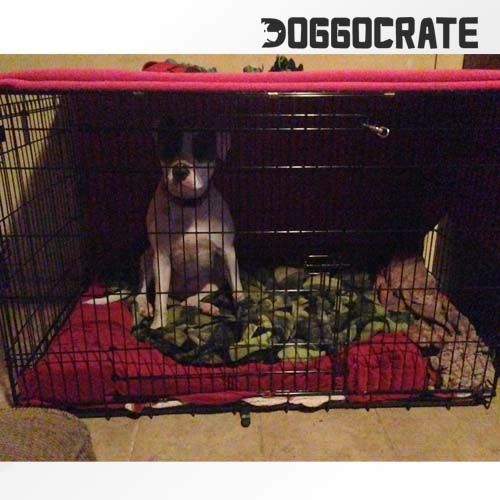 Simply keep your pup inside this cage, lock it and relax. Corners of this cage are round in shape so, there are least chances of any inconvenience. This model aims to save you and your doggie from possible harm and scratches. Additionally, your kids can also play around this cage without any issue. Keeping in view the safety of pets, the manufacturers have designed this sturdy and durable cage. 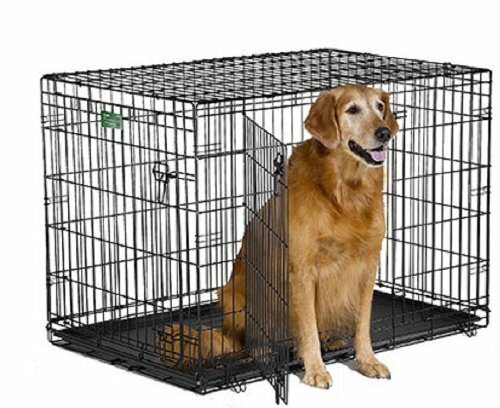 This kennel is equipped with heavy-gauge wire, which ultimately results in an increased durability. In short, you do not have to change your pet cage again and again as this product will last for an extended time period. Furthermore, a long-lasting rust-resistant electro-coat finish is also there to serve the purpose. Most of the people think that their puppy will become unhygienic, if they keep them inside the kennel for longer. But, this is not true when it comes to Precision pet crate because it includes a removable floor pan, which is made of polypropylene plastic. You can simply remove this tray for cleaning purpose. In this way, your pup will remain hygienic as well as away from any illness. This pet crate can also be folded, if you want to shift it from one place to another. This feature also allows the owners to carry it along, while traveling. With the passage of time, your pet grows and it becomes difficult to keep him in an old small-sized crate. 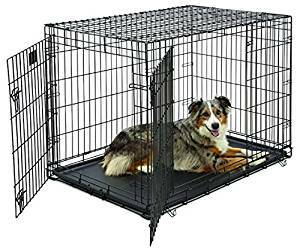 You do not need to spend more money on buying another kennel, if you already own this product because a divider panel is included within the package. 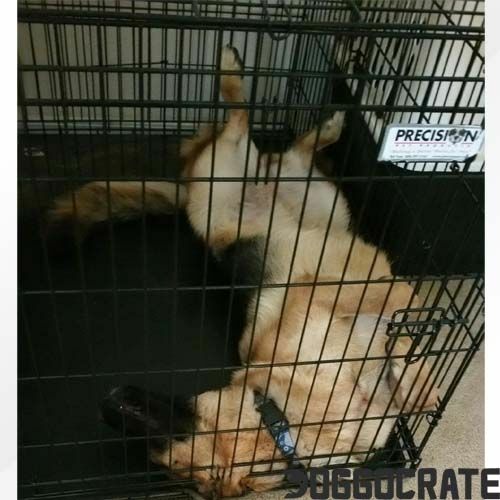 Which means that the length of crate can easily be altered as per the size of your doggie. Moreover, no extra amount is charged for this panel. Isn’t it great? The foldable design of this crate is not only travel-friendly, but is also light in weight. It does not require a huge space for storage, which is another plus point. It is a highly portable product therefore; you can also carry it along anywhere anytime. A handle is also present on its upper side to provide ease to the users. This pet cage has e-plated coating that makes cleaning effortless. Moreover, there will be no oxidation inside this cage due to its smooth and durable structure. This model is available in black color and you can get it in 6 different sizes. Its price is also reasonable and thus, it is worth buying this product. Built with heavy gauge PrecisionPet's Double Door Greate Dog Crate is a perfect cobination of durability and safety. It has easy to clean polypropylene plastic pan & an adjustable divider panel. The dual door helps you in placement of crate withotu worrying about entrance of your pet.